I don't kid when I say this is probably one of the BEST cakes I've ever eaten in my life. But then, I've found that any baked good including almond meal is amazing. Seriously, try it more often. It may look a bit plain, but the flavors will knock you out! The divine aroma and texture it provides is absolutely mouthwatering. And what's great about this cake is that it's SO easy to make! Using a standard dry-to-wet ingredient method, simply mix together flour, almond meal, cornmeal, baking powder, and salt. A note about almond meal: DO NOT waste your money and buy this premade in stores. All you need is whole unsalted almonds and a blender or food processor (both work well). About one handful usually amounts to 1/2 cup ground; just put in your machine of choice, and whirl until finely ground and it resembles bread crumbs. Now...if a recipe calls for almond meal, use unblanched almonds (with the brown skins still on). If a recipe calls for almond flour, use blanched almonds (without the skins). For this cake, I only had raw almonds (and I wasn't about to attempt to blanch them), so essentially I used almond meal instead of almond flour. Either one would probably be fine, but I think the meal added a bit of color and texture. Next, combine grapeseed oil (you can probably use any flavorless oil, like canola), brown sugar, vanilla and almond extracts, eggs, and Greek yogurt (you can probably substitute sour cream). Mix it all together, pour in a springform pan, and bake for 10 minutes. 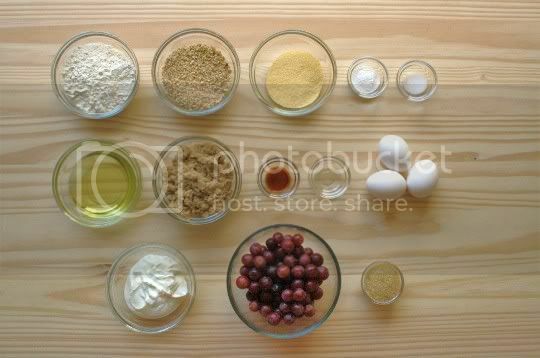 You want the batter to be just set, so then you can add the grapes on top without having them completely sink to the bottom. Place them carefully on the batter; they will sink slightly, but should remain about halfway visible. 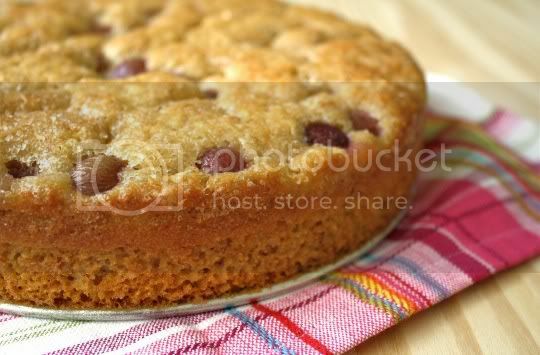 Generously sprinkle the cake with turbinado sugar (love that stuff!) before placing back in the oven, and bake until golden brown. The recipe suggests 25-30 minutes, but I needed an additional 10-15 for a really deep, rich color and complete doneness. The aroma that fills your kitchen while this bakes is simply intoxicating. And the result? A super moist, sticky, and hearty cake, with a nutty and chewy texture. It's deliciously sweet and aromatic. 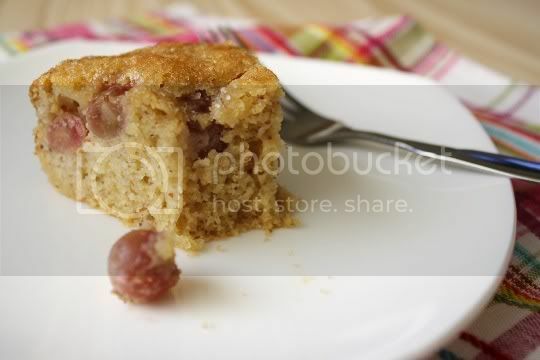 The top of the cake is crunchy and caramelized, and the grapes become extra plump and juicy, almost taking on a bit of a wine-y flavor. 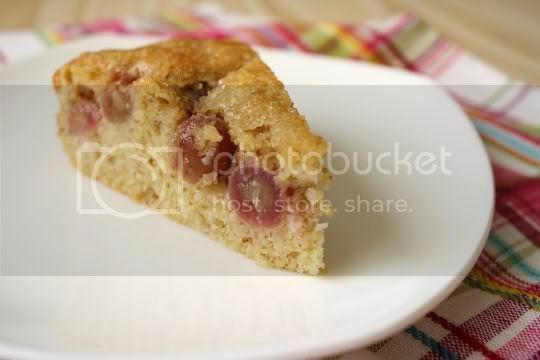 It's mindblowing eaten fresh from the oven; let the cake sit overnight, and it becomes even MORE flavorful (but be carfeul, leftovers more than two or so days old will start to get soggy from the heavy concentration of liquid in the grapes). You won't be able to get enough of this cake, and it's solid and hearty enough to have as a breakfast treat. Make again? No questions asked. This one goes on the list of favorites. Vegan variation: Use egg replacer and soy yogurt or sour cream substitute. mmh sounds delicious. but... would you mind giving some measurements? You will LOVE the cake! Enjoy!